They’re all pretty similar when it comes to output quality – practically identical, in fact. So let’s ignore that part of it for the moment, and, as our calculus professor used to say: It’s time to differentiate. Things we never used to pay attention to, we now pay attention to. Is it one of those inkjet printers where you stand up a sheaf of paper in the back and it feeds in from there? In that case, after a while – depending on the humidity – the paper starts to curl over, and sometimes stays that way. The open top of the printer also collects dust, crumbs, and random insects if you use it someplace like a backyard or apartment balcony. If the paper feed tray is at the bottom — but not completely enclosed — same problem: you get dust, dirt and cookie crumbs inside the printer. Why do manufacturers do that? Don’t they understand that a large opening to the inside of the printer might cause problems? Oh they understand, all right. So why do they do it that way? Because it’s cheaper, that’s why. Pennies and nickels have to be saved because there’s no money in selling the printers, the money is in selling ink. We all learn that as soon as we have to buy ink. Ah, the Ink. Well the ink is a dye, and you can buy large quantities of it from the same companies that sell to the big printer companies. You can also buy ink cartridges that perform substantially the same as the ones with the company’s brand name. You can buy no-name ink cartridges that will fit your printer just the same as the ones that came with it. We have done this and had only one bad experience. The price difference is stunning, something on the order of one-tenth the brand name price. You can also buy cheaper ink cartridges right from office supply stores. We bought replacement cartridges for our Hewlett Packard (HP) model 5510 all-in-one from Staples, a giant chain of office supply stores that circle the Earth. It wasn’t as cheap as the mysterious suppliers on the web but it was a lot cheaper than HP’s own brand and they worked fine. It was also one of the reasons we dumped the printer. 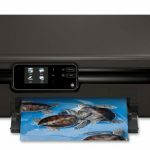 What is an “all-in-one” printer anyway? The name is a marketing gimmick. 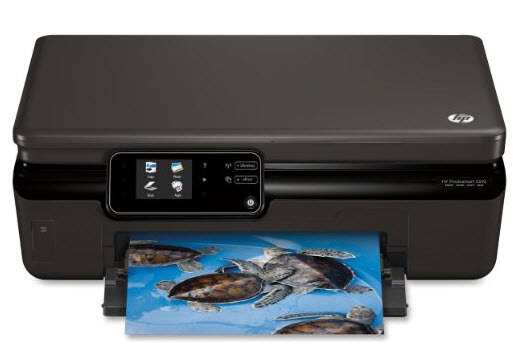 The only “all” part is a scanner that sits on top of a regular printer. (The fax part is software.) Our HP scanner worked twice and never again. The final blow was the constant screen messages telling us the printer had detected a non Hewlett Packard ink cartridge and we should replace it as soon as possible. Hey, we bought it from a reputable office supply store. Is HP that desperate for ink money? They probably are. So the ink message combined with the non-working scanner was enough to prompt us to dump our Hewlett Packard all-in-one. We bought a Canon all-in-one, the Pixma MX922. Are we happy now? Eh, so-so. The scanner part works. And the paper feed trays are all enclosed; in fact the part where the paper comes out stays closed until the machine is ready to print; pretty cool. How’s the print quality? Eh, not so hot. In fact, let’s face it: the quality is about what we got from color printers 20 years ago. How about the print speed? You will think you’ve been captured by aliens and they froze time to do it. We’ll try an Epson next. This could go on for years. But what about laser printers? Laser printers are great – except for the parts where they’re not. 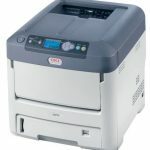 Laser printers are fast, cheap to operate, and the print quality is outstanding. They also cost about five times as much as an inkjet printer. Oh, and we forgot for a moment: boy, are they heavy. 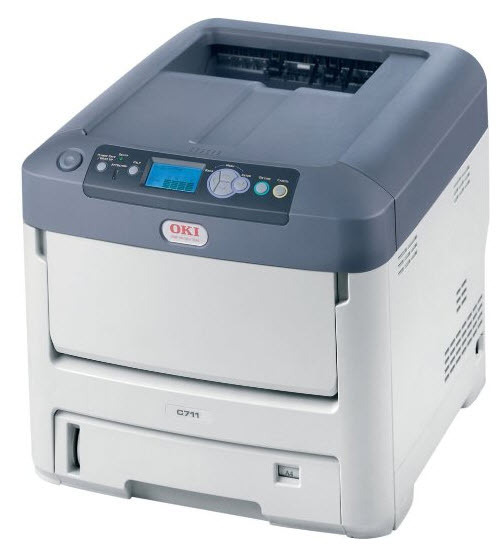 The Okidata printer we had for years produced quality as good as you would see in a classy color magazine. The only reason we gave it up is we moved our office and moving it too made us think about increasing our health insurance. It was so heavy we couldn’t give it away. Well, okay, the weight wasn’t the only reason. Laser printers use powdered ink mixed with glue to put print on the page. That glue and ink have to be melted by a hot roller so they will stick to the page. The roller is very hot. That means you don’t want to put in glossy photo paper. Because the coating on the paper can be melted by the roller and may stick to the image drum. This happened to us and we were told naughty, naughty, don’t do it again. Replacing the image drum is very expensive. Another problem that may or may not be serious is fumes. The hot roller that melts the ink and the glue necessarily gives off some fumes, which are blown out by the fan that cools the printer. It’s best to position it so that the fumes aren’t blown into your face. Whether or not these fumes are harmful has been the subject of much talk and almost no research for many years. Maybe those fumes are fine. Maybe they’re even healthy –though somehow we doubt it. It remains kind of off-putting. Might be best to have it not too close to where you’re sitting. And then of course, there are paper jams. These are tough to clear and often require sort of taking the printer apart. Don’t touch the hot roller! All things taken together, lasers are still best. They have the quality. Inkjets are cheap, quiet, light weight, and you can print on just about anything that will feed through the unit. (We used to have an inkjet printed necktie.) But the ink prices are outrageous, and something has to be done about that.